A few days ago, I wrote a crawler (with NodeJS and Sequelize) that fetches publicly available data from GitHub’s GraphQL API. More precisely, I downloaded information about users, repositories, programming languages and topics. After running the crawler for a few days, I ended up with 154,248 user profiles, 993,919 repositories and 351 languages, many of which I had never heard of (e.g. did you know about PogoScript?). However, although my MySQL database is already 953 MB in size with only these data, I barely crawled 0.4 % of all user profiles (~ 31 million). 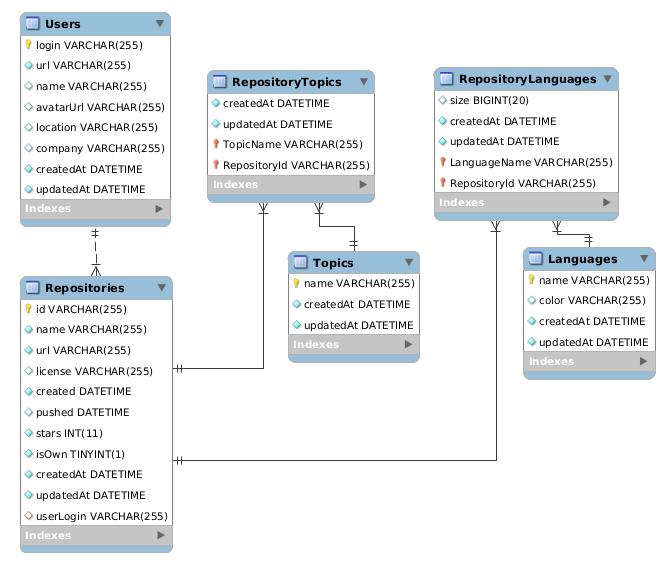 The first (less extensive) version of my database – which I performed the following analyses on – looked like this. While one could argue that the data I collected is not of a representative sample size, I still wanted to do some data analysis on it – just for fun. To perform the analyses, I used Python 3 with Pandas and Matplotlib. 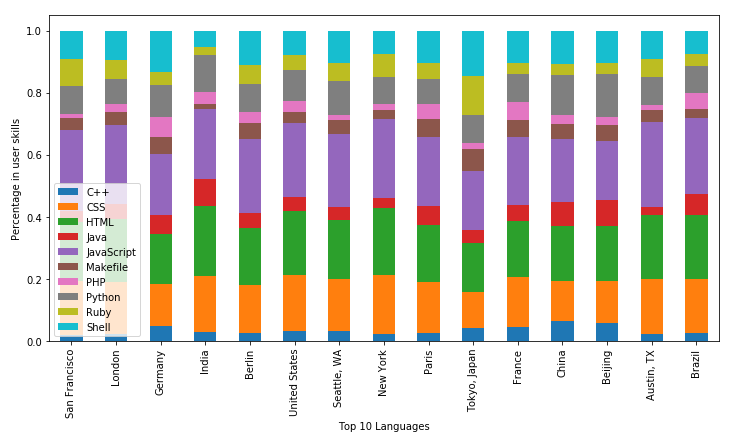 One of the first and most obvious thing to check (for the sake of brevity I’ll skip basic data set statistics like count, mean, variance, …) is which languages are most widely used. 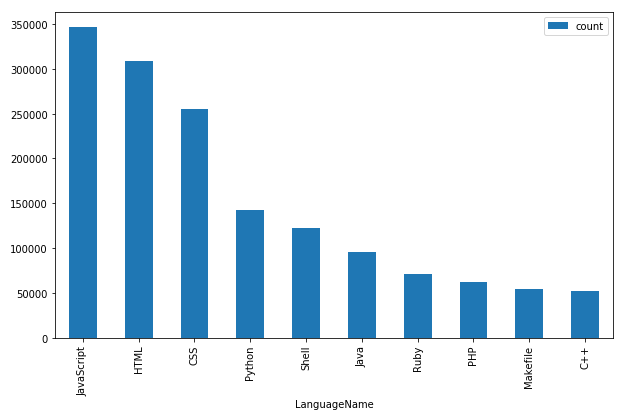 A little more interesting is to see, which programming languages occur least. Here are the results. Have you heard of any one of them? I didn’t. Let’s analyze the users’ skills in terms of languages. I decided to consider a user being “skilled” in a certain language if at least 10 % of her repositories’ code is in that language. What I wanted to look at is combinations of different skills, i.e. languages that usually occur together as developer skills. One approach to get insights like these is to mine the data for association rules, e.g. using an algorithm like Apriori (as I did). The implementation I used was asaini/Apriori. The left part of each row is a tuple of tuples of programming languages that represent an association rule. The right part is the confidence of that rule. Read ((('ShaderLab',), ('C#',)), 0.904) as “90 % of all people who know ShaderLab also know C#”. Let’s take a look at where most GitHub users are from. Obviously, this only respects profiles where users have set their locations. Clearly, San Francisco seems to be the most popular city for developers (or at least for those who are active on GitHub). To take this a step further, let’s take a look at which skills users tend to have in what cities. 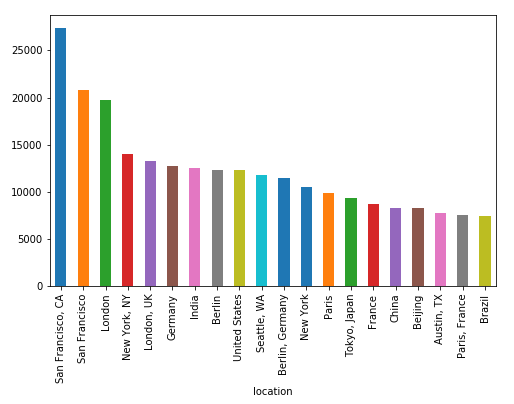 Look like there are no real outliers in the distribution of developer skills between different cities of the world. Maybe you could say that, e.g., Indians like web frontends a little more than command-line hacking. While an overview is cool, I found it even more interesting to specifically compare between to cities. 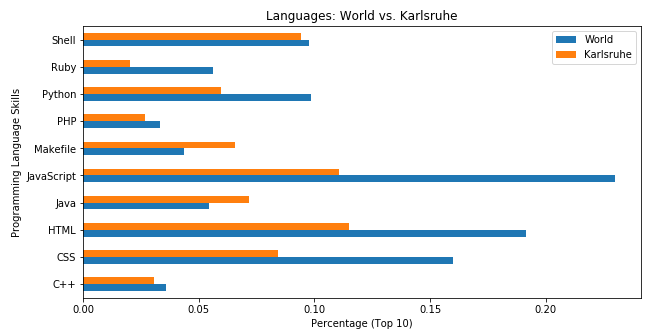 So in the following chart I compare language-specific programming skills in Karlsruhe (the city where I live and study) to the rest of the world’s average. Last but not least, let’s apply Apriori once more, but this time in a slightly different way. Instead of looking at user skills, let’s look at languages that occur together on a per-repository basis. And instead of trying to find rules, let’s only look at frequent item sets (which are the basis for rules). My expectation was to get back sets of commonly used tech stacks. Here, the left side is sets of frequently occurring combinations of languages. The right side is the set’s support, which is the relative occurrences of that set among the whole data set. Obviously, many of these are actually common “tech stacks” and almost all of them are web technologies. I guess GitHub is most popular among web developers. There is a lot of more complex analyses that could be might on rich data like this and probably tools like BigQuery are better suitable than Pandas, operating on a tiny sample. However, I used this little project to improve my EDA skills and hopefully give you guys an interesting article to read. Let me know if you like it!